I finally discovered the secret to “real” cold sesame noodles: it’s the Chinese sesame paste. There isn’t a good substitution. If you have access to an Asian grocery store, that’s your best bet, but you can find it online as well. 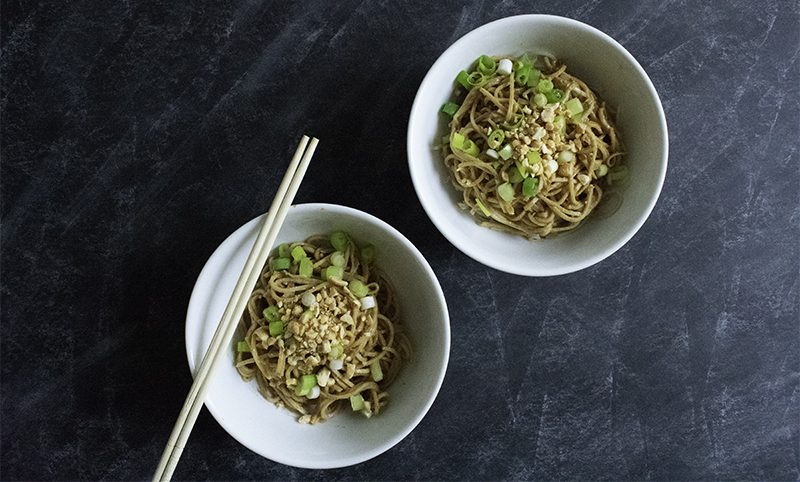 I owe this find to Sam Sifton of the New York Times and his recipe for Takeout-Style Sesame Noodles. I adapted and tweaked his recipe to remove the oil. I added options for whole wheat noodles and dates instead of sugar. The flavors are recall the best sesame noodles from Chinese restaurants, without the greasiness you can sometimes get. Bring a large pot of water to a boil. Add noodles and cook until barely tender, about 5 minutes. (If you choose whole wheat noodles, it may take longer.) Drain, rinse with cold water, drain again and pat dry with a paper towel. In a medium bowl, blender, or food processor, whisk together the remaining ingredients.